At the end of 2015, IFS carried out a global survey of over 1,000 IT decision makers from companies in 12 countries. The survey aimed to gather insight on the subject of change in businesses: its relevance, impact and drivers. The results revealed a number of interesting trends and here are my thoughts relating to the construction industry. In a world where opinion can be formed from 140 characters or an artistically filtered image, perception and reputation hangs by a thread. Construction has a reputation that it needs to combat: that the industry is old-fashioned and predominated by an older age group that is resistant to change. With a workforce that hovers around the 40-70 age bracket, there has traditionally been a preference for sticking with tried-and-tested methods. However, over the last five years we are starting to see a shift as the industry wakes up to the new technologies and approaches out there that offer significant benefits. And more importantly, those that provide companies with the ability to respond quickly and efficiently to change. 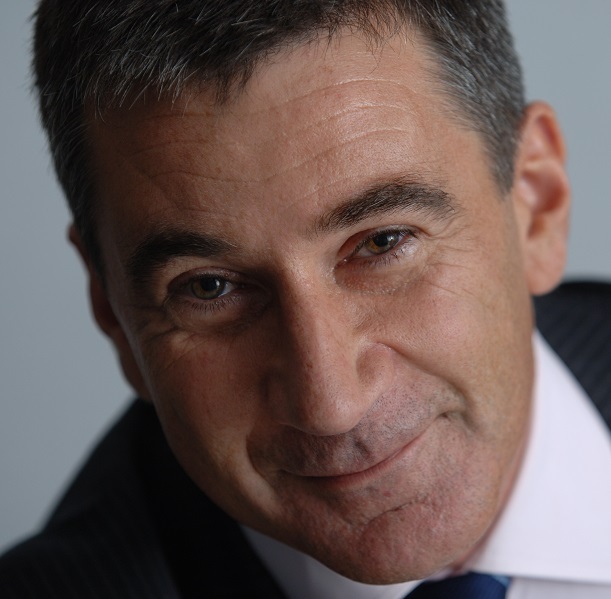 But what exactly are the most important drivers for change in the construction industry? We recently carried out a survey asking IT decision-makers to share their thoughts on how they perceive change, which changes they consider the most influential and how these market or social changes impact their business. Respondents in the construction sector highlighted customer demand and c-level decision-makers as being the most influential factors in bringing about change for their businesses, but perhaps more interesting is the importance they place on government change as a factor of influence (selected 26% of the time). This is perhaps unsurprising as construction is highly driven by government spending, specifically with regards to schools, hospitals, transport infrastructure, nuclear power plants and more. The biggest construction projects are often state-funded or executed by joint ventures. However, these projects require money, and lots of it. But at a time when we are still facing a certain level of austerity, money isn’t necessarily easy to come by. So governments are challenging the construction industry to start working smarter in order to lower the costs of building and maintenance. All is not doom and gloom however. In the past 100 years, there hasn’t been such a large-scale revolution as the one taking place today in the construction sector. 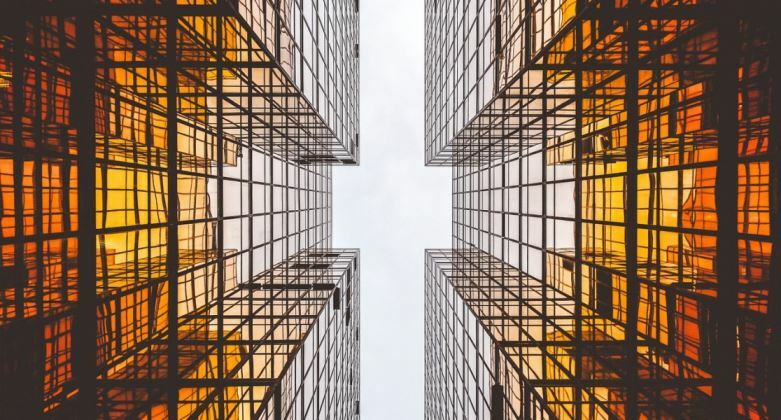 With the introduction of digital asset lifecycle processes such as building information modelling (BIM), mobility, robotics and IoT, governments are forcing the construction industry to rethink old practices and embrace the change that these technologies have to offer. This forward thinking can already be seen in many construction companies who are embracing digital technologies and a more integrated approach in order to stay competitive. In particular, BIM is taking off – a good example is the UK government, which is prioritizing BIM as part of its “Digital Britain” initiative. As a result, we are increasingly seeing the term BIM appear in job titles at many construction firms. 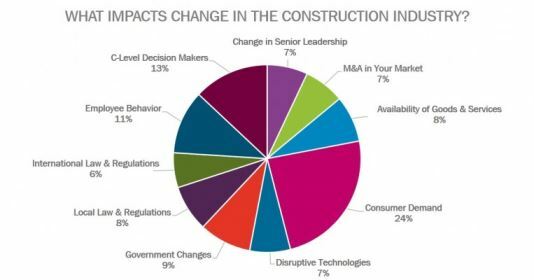 Relative to the impact of government change, the survey brings to light the lack of influence that mergers and acquisitions are considered to have on business-change in the construction sector (selected only 19% of the time). This reflects that the construction industry sees less M&A activity than other industries, but what is notable for us is the growing use of joint ventures and alliances to deliver projects. Now, construction projects are so big that they need more than one company to manage the contract, maintain the assets and so on, which is leading multiple organizations to form new companies or joint ventures – take the water industry alliance, eight2o, as one recent example. I would argue that the biggest challenge facing the construction industry and its ability to change is the lack of skilled professionals. The industry needs to invest in a younger workforce that is passionate about adopting innovative and forward-thinking technology. We are at the start of what I believe is a very exciting journey, one where finally we are starting to see the change needed to ensure that the construction industry keeps up with the rest of the world.